It is often said that the ladies love a man in uniform, and surely the ultimate uniform would be that of the hussar. Certainly those that wore this Hungarian costume during the Napoleonic Wars thought so, and missed no opportunity to decorate themselves as richly as possible. This came as naturally to the French as anyone, and Napoleon's hussars were very proud of both their dashing appearance and supposed military prowess, although many did not share their confidence in the latter. Still these were amongst the most colourful troops in what was a pretty colourful army by any standards, and it is good to see a fresh set to join the Italeri set that has been available for several years. While military uniform was often anything but uniform, the hussars stand out as being masters of avoiding or embellishing regulations to improve their appearance. This set depicts them all wearing the trademark pelisse, with most wearing it over the torso rather than hanging round the left shoulder. All have a shako which is slightly bell-shaped and with a tall plume at the front. This suggests the first half of the imperial period (plumes were officially abolished in 1809), although many men held on to older kit long after newer items were issued (taller, straighter shakos were issued from 1812). One curiosity is none of the shakos have a front plate, which would have been normal for this type. On the legs these men wear breeches, and the traditional boots are in full view, so they are not wearing any overalls, which is a surprise for campaign wear. Finally hussars were very proud of their distinctive hair, and only reluctantly adopted the short hair style when forced to do so. These men all have rather short queues, which were finally removed by 1808, and none have the pleated locks down the cheeks. A few seem to have no moustache, which is unthinkable for a hussar of any age, so we must be charitable and say these are smaller, neater examples that do not justify extra plastic on the face! The horses all seem to be at speed, leaving none for the less dramatic but very common work of guard duty, reconnaissance and skirmishing. Some poses are better than others, but they are all provided with the shabraque trailing down to a point, a feature mostly found only under officers - troopers usually had just the sheepskin on top. The riders fit the animals very well without the over-tight 'popping' that has afflicted some recent Strelets sets. Harness and horse furniture are all reasonable although there is no sign of the holsters into which the pistol or pistols would be placed. The poses are largely the same as those to be found in many other Strelets cavalry sets, although here many have been realised with more life than usual. The first pose on the top row is a standout example as he really seems to lean in to the charge and is particularly three-dimensional. The man firing his pistol (and the man holding his aloft) should really have his sabre hanging from its strap over his right wrist as the routine was to fire the pistol just before contact with the enemy (pistols were very inaccurate at much beyond point blank range), then pass it to the left hand and immediately take up the sabre, for by then you were beside the enemy. 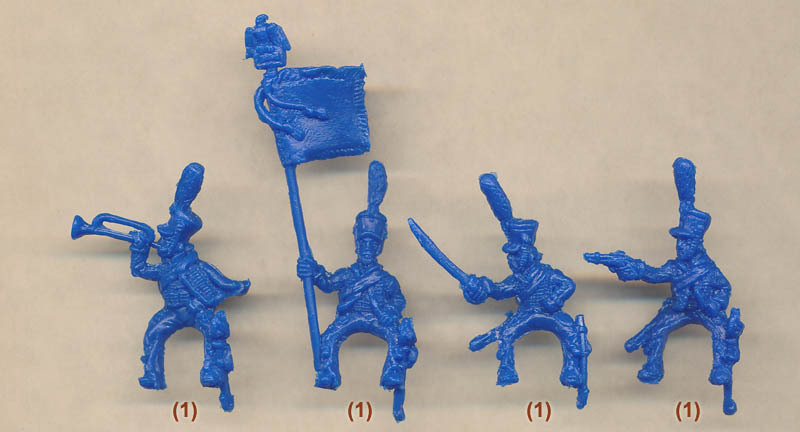 The trumpeter is another really nice pose, but the standard-bearer, while perfectly reasonable, will be less useful as hussars were ordered not take their eagles into the field (although many still did). The usual Strelets style of rather chunky components and fair detail is on show once again here, with sword scabbards and musketoons being particularly short. However facial features are very nice, although as usual this is achieved by having the head considerably larger than in reality. The chinscales on the shakos have been positioned extremely high, which does look odd and will be difficult to remedy, and all the fine detail braiding on the pelisse, which would challenge any sculptor, does not lend itself to the Strelets style, but these give a fair impression and are free of flash. Since there are no separate weapons there is no assembly required in this set. While hussars are notoriously difficult to date these figures suggest a period of 1805 to around 1807. The very high detail required on these uniforms was always going to require some compromise for the Strelets style, but we did like many of the human poses, and the addition of some men firing weapons fills a gap left by the Italeri set. In all honestly these do not compare well with the beautifully produced Italeri figures, but they do have something of the flamboyance of the originals and will doubtless serve well on many a table.